You have such amazing fortitude. I don’t think I’d handle things with such grace. Thank you Sean. It isn’t easy, but it helps to take things as they come with patience – like my kids! 😏 At the end chaos and overreacting never got me anywhere. Never it, I agree. Hope is all we have, and understanding that when things don’t change, we also allow ourselves sometime to accept the realities of that as well. Well put, Ana. I find that us humans are stronger than sometimes we even dare to even imagine. You will conquer. I believe that, my friend. Take good care. Haha I do the same! The hang in there though is more than what we casually say and it took someone to say it to me that day for it to hit me harder than it should have. Or am I just reading too much into things?! Perhaps. But you’re absolutely right. Oh that ‘new normal.’ I was just saying last night, I don’t know what my body felt like before, now all I feel is pain, it’s pain somewhere in my body, but it’s always pain – physical pain. You know?! There’s never a pain-free day or a day where I can say, yes I’ll do that! Without thinking of what the following days would be like if I did. Ever since I found your blog you have provided so much hope and so much confirmation in the human spirit. Thank you. 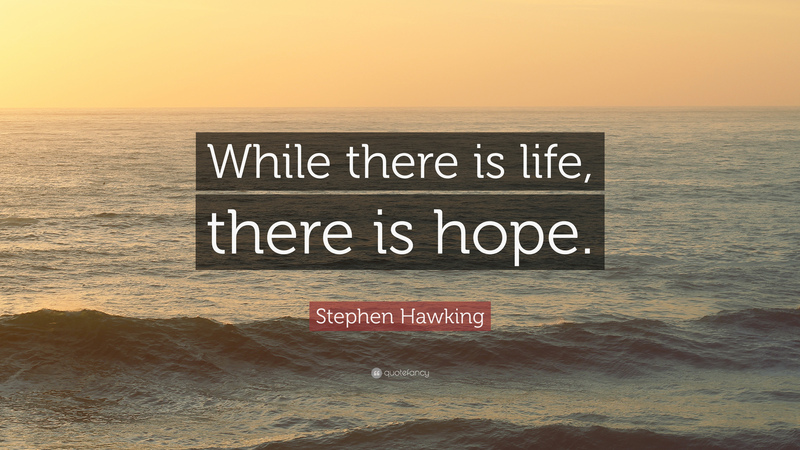 We all live in hope. Sending you hugs. Such a lovely comment. I’m so happy you’ve found something to lift you, even if just a little. Likewise, the courage you demonstrate through your words and your sweet boy is unlike any other. How many times? How often for sure. You’re a brave person full of hope, despite hardships. I admire that. You’ll persevere, I’m sure of that. We always persevere, no matter the struggles. Thank you so much! What a traumatic experience you are going through with those pains. As you say, the hope of solving them can condition your treatment mentally so that you can achieve it. At least you have the courage to do it. A hug. Your writing is hope filled, I think it will encourage others and lift you as a result! Thank you so much! My wish is that it will. Hope you’re doing well. Ana, with all due respect, I can understand where you’re coming from. Somehow I’ve injured my neck and I’ve been told that I have arthritis in my neck and back. Here lately I’ve been hurting like crazy. I don’t feel 40. I feel older! I’m thinking fibromyalgia but not sure. I hate your feeling this and having to go through this. But just know you’re not the only one hurting. We’ll hurt together mi amiga! Yes! He mentioned it may cause arthritis. What horrible pain you’re experience! You must get yourself checked, at least to know what you can do to help with the pain. oh Ana………I know the “pain” of new findings……….I sent up a prayer of health and healing for you and for a miracle ~ in order for me to get through each day I have to remind myself that miracles still happen.